Comet is a unicorn pattern to end all unicorn patterns! Her unique body shaping sets her high above the rest, with oodles of magic to match! This enchanted babe’s body is made all in one elegant piece so there’s no sewing except to attach the head, facial features and hair. From hoof to neck she is one solid chunk of mythical mare! Comet’s design has been years in the making, combining the evolution of Jessie’s Nomadic Galaxy Ponies and her Tiny Hoof Unicorns into the final culmination of one most whimsical, day-dreamy creature to share with you! This PDF pattern contains over 90 pages and more than 550 high quality photos. Read on for more info and FAQ. Comet is designed with a combination of acrylic yarn and merino wool in double knit and 4 ply weights. ~40cm (~15.75″) tall to the tip of her ears. Intermediate – but written to be accessible to beginners by all the additional info supplied. Comet the Unicorn will be an heirloom you can pass down for generations – choose the best quality yarn you can or one of our gorgeous yummy ‘licious and custom dyed Miss La Motte kits. Q: What is a CAL? A: A pattern that gets released in parts over a certain period of time, so that we can all crochet along together. Typically we release a part per week until completed. Q: When does the CAL start? A: Part 1 comes out on 21 November 2018. Another part will be released every Wednesday after that until the last part on 12 December so you can finish her in time for Christmas prezzies! A: Choose your purchase option in this post – either on Hooked on Sunshine or Ravelry, both options are named. Q: How many part of there? A: Five: A Prelude, plus four pattern parts. You’ll have immediate access to the Prelude after signing up so that you can prepare. You’ll get access to Parts 1-4 of the pattern in November. Q: What yarn and supplies do I need for making Comet? A: You’ll be able to download a Prelude once you’ve signed up that will tell you everything you need to prepare including all supplies and skills. A: The CAL will cost $15 USD. Dependent on the platform you purchase and your territory, there may be tax/vat added to your purchase. A: A professional, high quality document that has been thoroughly tested. 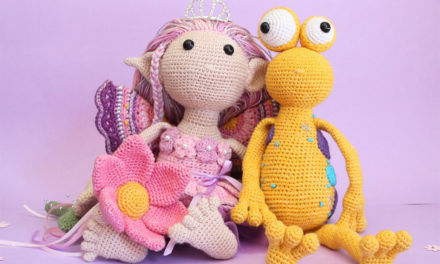 It is easy to follow and understand, with hundreds of pictures and detailed but clear instructions for making a unique Amigurumi with sophisticated body shaping. You’ll also get an extra Amigurumi Tips booklet with helpful tips and tutorials for every technique used in this pattern except the basic crochet stitches. In additional, you’ll have access to a massive support network for help if you need it. Q: Will the CAL be available on Ravelry? Q: Are there Yarn kits I can buy? A: Yes. There are 2 different options. You can purchase them from the links in this post. Q: Can I sign up without buying a kit? Q: Can I get the pattern after the CAL is over? A: Yes. If you sign up for the CAL you’ll get a copy of the complete pattern when the CAL is over – Early Bird Pre-registration gets you two colour-in line drawings and a 10% discount on another Projectarian pattern purchase. If you do not sign up for the CAL, you can purchase the complete pattern for $15 USD when the CAL is over. Q: Can I try one of your free patterns first? A: Yes – try Orbit the Dragon! Q: I’ve signed up! How do I get my pattern? A: If you are pre-registering – the Prelude will be available, but the Parts will only be released on the specified dates. While these updates are automatically sent by email, they may be blocked by spam filtering – so we recommend you check your library on each release day to get the files. Once you have registered – you will be able to access your files in your pattern library – either on Hooked on Sunshine or Ravelry. Please note that you may need to refresh or update your Ravelry library. Q: Okay, but how do I get the next part of my pattern? A: Once the next part has been released, sign into your account where you purchased the CAL. Locate your pattern library and refresh it to show your new files. Hubble the Squid will be treasured for years – choose the best quality yarn you can or one of our gorgeous yummy ‘licious and custom dyed Miss La Motte kits.